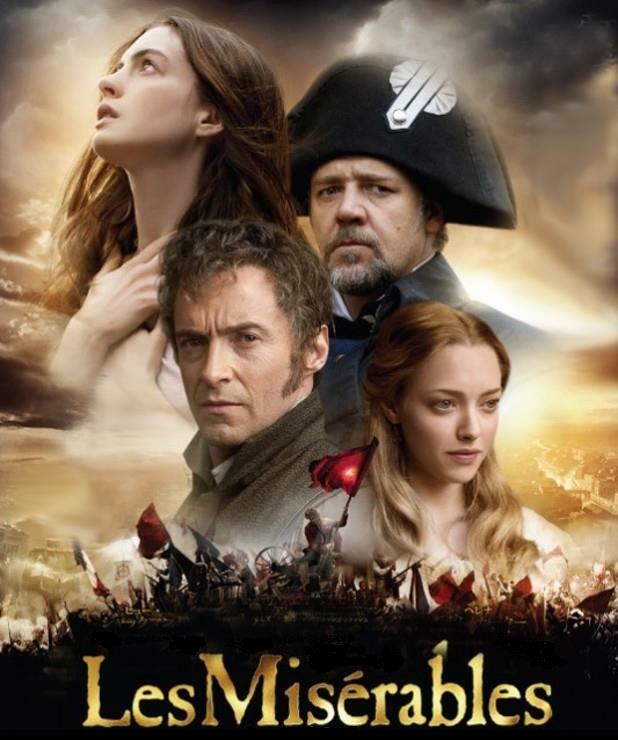 The film starts when a Frenchman named Jean Valjean (Hugh Jackman) is released from Toulon prison by Inspector Javert (Russell Crowe) after spending 19 years imprisoned for stealing . The Bishop of Digne offers the convict food and shelter, and saves his life when he is caught stealing the bishop’s silver. Deciding to start a new life, Valjean breaks his parole.Eight years later, Valjean has become a factory owner and mayor of Montreuil-sur-Mer. Fantine (Anne Hathaway), one of his workers, is discovered by her coworkers to be sending money to her illegitimate daughter Cosette (Amanda Seyfried). When she is dismissed by the foreman, Fantine is forced to become a prostitute. However During an argument with an abusive customer, Javert, now a police inspector in Montreuil, arrests Fantine, but Valjean takes her to a hospital and promises a dying Fantine he will care for Cosette. After a brief confrontation with Javert, Valjean flees and paysgruesome innkeeperMadame Thénardier (Helena Bonham Carter) and her dodgy husband (Sacha Baron Cohen) to take Cosette in and raise her.Sadly though they mistreat Cosette while indulging their own destitute daughter, Éponine (Samantha Barks). Nine years later, Paris is in turmoil because Jean Maximilien Lamarque, the only man in the government who shows any sympathy for the poor, is nearing death. So a street urchin named Gavroche, (12-year-old Daniel Huttlestone) incites the prostitutes and beggars to take action, while a student revolutionary and young firebrand named Marius Pontmercy (Eddie Redmayne)and his friend Enjolras (Aaron Tveit)organize a group of idealistic students to protest against the Governments treatment of the poor. While organising the protest Marius becomes friends with the Thenardiers’ daughter, Éponine, then he meets Cosette and they fall in love. Morrissey’s lyrics have been described as “dramatic, bleak, funny vignettes about doomed relationships, lonely nightclubs, the burden of the past and the prison of the home.” He is also noted for his unique baritone vocal style (though he sometimes uses falsetto), his quiff haircut and his dynamic live performances.Although they had limited commercial success outside the UK while they were still together, and never released a single that charted higher than number 10 in their home country, The Smiths won a significant following, and remain cult and commercial favourites. The band broke up in 1987 and have turned down several offers to reunite since then.Morrissey’s forthright and often contrarian opinions have also led to a number of media controversies, and he has also attracted media attention for his advocacy of vegetarianism and animal rights. One of the most famous and revered actors of the 20th century, the English stage & screen actor, director, and producer Sir Laurence Olivier, was born 22nd May 1907. He was also the youngest actor to be knighted and the first to be elevated to the peerage. He married three times, to actresses Jill Esmond, Vivien Leigh, and Joan Plowright. Actor Spencer Tracy said that Olivier was ‘the greatest actor in the English-speaking world’.During his long and distinguished career Olivier played a wide variety of roles on stage and screen from Greek tragedy, Shakespeare and Restoration comedy to modern American and British drama. He was the first artistic director of the National Theatre of Great Britain and its main stage is named in his honour. He is regarded by some to be the greatest actor of the 20th century, in the same category as David Garrick, Richard Burbage, Edmund Kean and Henry Irving in their own centuries. Olivier’s AMPAS acknowledgments are considerable: twelve Oscar nominations, with two awards (for Best Actor and Best Picture for the 1948 film Hamlet), plus two honorary awards including a statuette and certificate. He was also awarded five Emmy awards from the nine nominations hereceived. Additionally, he was a three-time Golden Globe and BAFTA winner. Olivier’s career as a stage and film actor spanned more than six decades and included a wide variety of roles, from the title role in Shakespeare’s Othello and Sir Toby Belch in Twelfth Night to the sadistic Nazi dentist Christian Szell in Marathon Man and the kindly but determined Nazi-hunter in The Boys from Brazil. A High church clergyman’s son who found fame on the West End stage, Olivier became determined early on to master Shakespeare, and eventually came to be regarded as one of the foremost Shakespeare interpreters of the 20th century. He continued to act until the year before his death in 1989. Olivier played more than 120 stage roles: Richard III, Macbeth, Romeo, Hamlet, Othello, Uncle Vanya, and Archie Rice in The Entertainer. He appeared in nearly sixty films, including William Wyler’s Wuthering Heights, Alfred Hitchcock’s Rebecca, Stanley Kubrick’s Spartacus, Otto Preminger’s Bunny Lake Is Missing, Richard Attenborough’s Oh! What a Lovely War, and A Bridge Too Far, Joseph L. Mankiewicz’s Sleuth, John Schlesinger’s Marathon Man, Daniel Petrie’s The Betsy, Desmond Davis’ Clash of the Titans, and his own Henry V, Hamlet, and Richard III. He also preserved his Othello on film, with its stage cast virtually intact. For television, he starred in The Moon and Sixpence, John Gabriel Borkman, Long Day’s Journey into Night, Brideshead Revisited, The Merchant of Venice, Cat on a Hot Tin Roof, and King Lear, among others.Olivier was created a Knight Bachelor on 12 June 1947 in the King’s Birthday Honours, becoming the youngest actor so honored. Nominated by Prime Minister Harold Wilson, he was created a life peer on 13 June 1970 in the Queen’s Birthday Honours as Baron Olivier, of Brighton in the County of Sussex, the first actor to be accorded this distinction. He was admitted to the Order of Merit in 1981, the first actor to be so honoured. The Laurence Olivier Awards, organised by The Society of London Theatre, were renamed in his honour in 1984.Though he was a knight, a life peer, and one of the most respected personalities in the industry, Olivier insisted he be addressed as “Larry”, which he made clear he preferred to “Sir Laurence” or “Lord Olivier”.In 1999, the American Film Institute named Olivier among the Greatest Male Stars of All Time, at number 14 on the list.Sadly Olivier died at his home in Steyning, West Sussex, England, from renal failure on 11 July 1989. He was survived by his son Tarquin from his first marriage, as well as his wife Joan Plowright and their three children. He was cremated and his ashes interred in Poets’ Corner in Westminster Abbey, London. Olivier is one of only a few actors, along with David Garrick, Henry Irving, Ben Jonson and Sybil Thorndike to have been accorded this honour. Olivier is buried alongside some of the people he portrayed in theatre and film, for example King Henry V, General John Burgoyne and Air Chief Marshal Hugh Dowding. Fifteen years after his death, Olivier once again received star billing in a film. Through the use of computer graphics, footage of him as a young man was integrated into the 2004 film Sky Captain and the World of Tomorrow in which Olivier “played” the villain. Scottish physician and writer Sir Arthur Conan Doyle, was born 22nd May 1859. He is most noted for his stories about the detective Sherlock Holmes, generally considered a milestone in the field of crime fiction, and for the adventures of Professor Challenger. He was a prolific writer whose other works include science fiction stories, plays, romances, poetry, non-fiction and historical novels. He was born at 11 Picardy Place, Edinburgh, Scotland and was sent to the Roman Catholic Jesuit preparatory school Hodder Place, Stonyhurst, at the age of nine (1868-1870). He then went on to Stonyhurst College until 1875. From 1875 to 1876 he was educated at the Jesuit school Stella Matutina in Feldkirch, Austria.From 1876 to 1881 he studied medicine at the University of Edinburgh, including periods working in Aston in Birmingham, Sheffield and Ruyton-XI-Towns in Shropshire . While studying, Conan Doyle began writing short stories. His earliest extant fiction, “The Haunted Grange of Goresthorpe”, was unsuccessfully submitted to Blackwood’s Magazine. His first published piece “The Mystery of Sasassa Valley”, a story set in South Africa, was printed in Chambers’s Edinburgh Journal on 6 September 1879. Later that month, on 20 September, he also published his first non-fictional article, “Gelsemium as a Poison” in the British Medical Journal.In 1882 he joined a former classmate at a medical practice in Plymouth, but Conan Doyle soon left to set up an independent practice. Arriving in Portsmouth in June of that year, he set up a medical practice in Southsea, and While waiting for patients, Conan Doyle again began writing stories and composed his first novels, The Mystery of Cloomber, not published until 1888, and the unfinished Narrative of John Smith, which would go unpublished until 2011. He amassed a portfolio of short stories including “The Captain of the Pole-Star” and “J. Habakuk Jephson’s Statement”, both inspired by Doyle’s time at sea. His first significant piece, A Study in Scarlet, appeared later that year in the Beeton’s Christmas Annual and received good reviews. The story featured the first appearance of Dr Watson and Sherlock Holmes. A sequel to A Study in Scarlet called The Sign of the Four appeared in Lippincott’s Magazine in February 1890. Conan Doyle then went on to write many more Sherlock Holmes short stories including A Scandal in Bohemia, A Case of identity, The Red Headed league, The Boscombe Valley Mystery, The Man wth the Twisted Lip and The Five Orange Pips. In 1890 after studying ophthalmology in Vienna, Conan Doyle moved to London, first living in Montague Place and then in South Norwood. He set up a practice as an ophthalmologist. He wrote in his autobiography that not a single patient crossed his door. This gave him more time for writing, and in November 1891 he wrote to his mother: “I think of slaying Holmes… and winding him up for good and all. He takes my mind from better things.” His mother responded, “You won’t! You can’t! You mustn’t!”In December 1893, in order to dedicate more of his time to what he considered his more important works (his historical novels), Conan Doyle had Holmes and Professor Moriarty apparently plunge to their deaths together down the Reichenbach Falls in the story “The Final Problem”. Public outcry, however, led him to bring the character back in 1901, in The Hound of the Baskervilles, though this was set at a time before the Reichenbach incident. In 1903, Conan Doyle published his first Holmes short story in ten years, “The Adventure of the Empty House”, in which it was explained that only Moriarty had fallen; but since Holmes had other dangerous enemies—especially Colonel Sebastian Moran—he had arranged to also be perceived as dead. Holmes ultimately was featured in a total of 56 short stories and four Conan Doyle novels, and has since appeared in many novels and stories by other authors. ‘The Final Problem’ was published in 1913 and ‘The Valley of Fear’ was serialised in 1914.Conan Doyle sadly passed away on 7 July 1930. after having a heart attack at the age of 71. His last words were directed toward his wife: “You are wonderful.” The epitaph on his gravestone in the churchyard reads, in part: “Steel true/Blade straight/Arthur Conan Doyle/Knight/Patriot, Physician, and man of letters”. A statue honours Conan Doyle at Crowborough Cross in Crowborough, where he lived for 23 years and There is also a statue of Sherlock Holmes in Picardy Place, Edinburgh, close to the house where Conan Doyle was born.